City in the county of Oedenburg (Sopron), Hungary. The Jewish community of Eisenstadt is the only community of Hungary that has an independent political existence with an organization of its own, though the neighboring Mattersdorf (Nagy-Márton) was on the same footing until 1903. Unlike other Hungarian communities of the present day, Eisenstadt has the right to elect its own mayor in addition to its president, although both offices can be, and generally are, held by one and the same person. Eisenstadt, which once belonged to the "Sheba' Ḳehillot" (Seven Communities), is among the oldest communities in Hungary. It is mentioned as early as 1388. 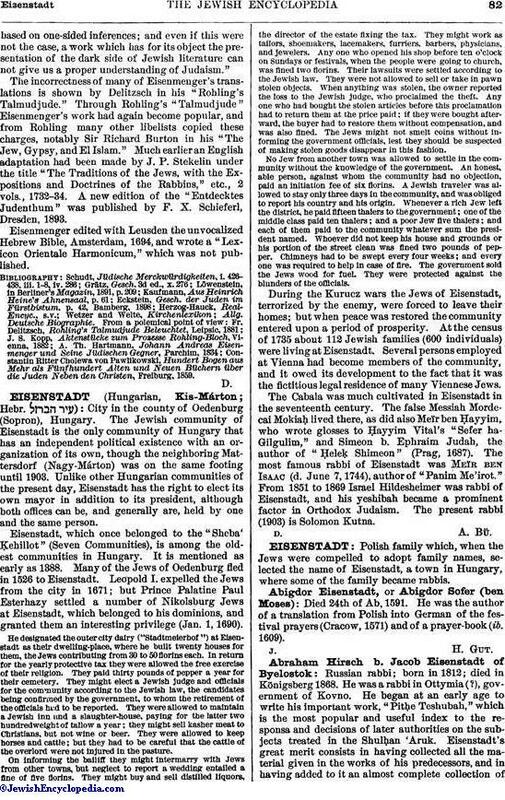 Many of the Jews of Oedenburg fled in 1526 to Eisenstadt. Leopold I. expelled the Jews from the city in 1671; but Prince Palatine Paul Esterhazy settled a number of Nikolsburg Jews at Eisenstadt, which belonged to his dominions, and granted them an interesting privilege (Jan. 1, 1690). He designated the outer city dairy ("Stadtmeierhof") at Eisenstadt as their dwelling-place, where he built twenty houses for them, the Jews contributing from 30 to 50 florins each. In return for the yearly protective tax they were allowed the free exercise of their religion. They paid thirty pounds of pepper a year for their cemetery. They might elect a Jewish judge and officials for the community according to the Jewish law, the candidates being confirmed by the government, to whom the retirement of the officials had to be reported. They were allowed to maintain a Jewish inn and a slaughter-house, paying for the latter two hundredweight of tallow a year; they might sell kasher meat to Christians, but not wine or beer. They were allowed to keep horses and cattle; but they had to be careful that the cattle of the overlord were not injured in the pasture. On informing the bailiff they might intermarry with Jews from other towns, but neglect to report a wedding entailed a fine of five florins. They might buy and sell distilled liquors, the director of the estate fixing the tax. They might work as tailors, shoemakers, lacemakers, furriers, barbers, physicians, and jewelers. Any one who opened his shop before ten o'clock on Sundays or festivals, when the people were going to church, was fined two florins. Their lawsuits were settled according to the Jewish law. They were not allowed to sell or take in pawn stolen objects. When anything was stolen, the owner reported the loss to the Jewish judge, who proclaimed the theft. Any one who had bought the stolen articles before this proclamation had to return them at the price paid; if they were bought afterward, the buyer had to restore them without compensation, and was also fined. The Jews might not smelt coins without informing the government officials, lest they should be suspected of making stolen goods disappear in this fashion. No Jew from another town was allowed to settle in the community without the knowledge of the government. An honest, able person, against whom the community had no objection, paid an initiation fee of six florins. A Jewish traveler was allowed to stay only three days in the community, and was obliged to report his country and his origin. Whenever a rich Jew left the district, he paid fifteen thalers to the government; one of the middle class paid ten thalers; and a poor Jew five thalers and each of them paid to the community whatever sum the president named. Whoever did not keep his house and grounds or his portion of the street clean was fined two pounds of pepper. Chimneys had to be swept every four weeks; and every one was required to help in case of fire. The government sold the Jews wood for fuel. They were protected against the blunders of the officials. During the Kurucz wars the Jews of Eisenstadt, terrorized by the enemy, were forced to leave their homes; but when peace was restored the community entered upon a period of prosperity. At the census of 1735 about 112 Jewish families (600 individuals) were living at Eisenstadt. Several persons employed at Vienna had become members of the community, and it owed its development to the fact that it was the fictitious legal residence of many Viennese Jews. The Cabala was much cultivated in Eisenstadt in the seventeenth century. The false Messiah Mordecai Mokiaḥ lived there, as did also Meïr ben Hayyim, who wrote glosses to Ḥayyim Vital's "Sefer ha-Gilgulim," and Simeon b. Ephraim Judah, the author of "Ḥeleḳ Shimeon" (Prag, 1687). The most famous rabbi of Eisenstadt was Meïr ben Isaac (d. June 7, 1744), author of "Panim Me'irot." From 1851 to 1869 Israel Hildesheimer was rabbi of Eisenstadt, and his yeshibah became a prominent factor in Orthodox Judaism. The present rabbi (1903) is Solomon Kutna.